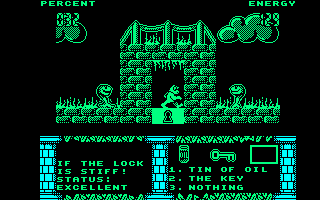 The programmers at Elite probably wanted to restore their honour after the disastrous conversion of Ghosts'n Goblins to the CPC. Once again, the fight between good and evil is at stake in this perfect clone of the arcade classic. After a short introduction, you are cast into the battle, featuring ugly monsters to smash in, bottomless chasms to avoid, and bonuses to collect. At the end of each of the three levels, another large monster awaits to scalp your long blond hair. The presentation is quite polished, but the game is extremely difficult and frustrating. If you persevere, though, it is possible to finish it with the nine lives you have, provided you have not broken your monitor with rage before then. Watch YouTube videos of this game by: Metr81, Novabug. Biff is a chimpanzee, but he's been very naughty and his mother has kicked him out of the treehouse. In order to please her again, he must complete various tasks. This is an arcade adventure in which you roam around a landscape, picking up objects and using them in certain places. Each time you do so, you score some points and get a clue as to what you need to do next. To make things a little easier, the next object to use flashes when it's on the screen. All of this means that the game has a very linear structure because you cannot choose what task you wish to perform next, and although critics may dislike this style of gameplay, I don't mind it too much. 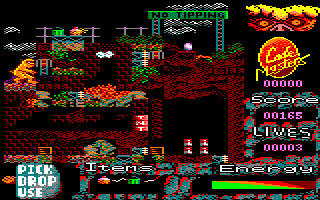 However, it's a shame that the game is a Spectrum port; everything is green, and there is no sound at all. Big Foot's girlfriend has been captured and has been imprisoned in a cage in the National Park, and the only way that Big Foot can free her is by finding the pieces of wire scattered around the park, connecting them to the cage and running a high voltage to blow the lock. The playing area is quite big and there are a lot of hazards – the most common being molten lava! In fact, more often than not, you'll keep jumping into them and losing lives. The graphics are gorgeous, but Big Foot seems to have a mind of his own and the game becomes annoying. Jim Biggles, the brother of the famous World War I fighter pilot, learns of a German secret weapon that could change the course of history. 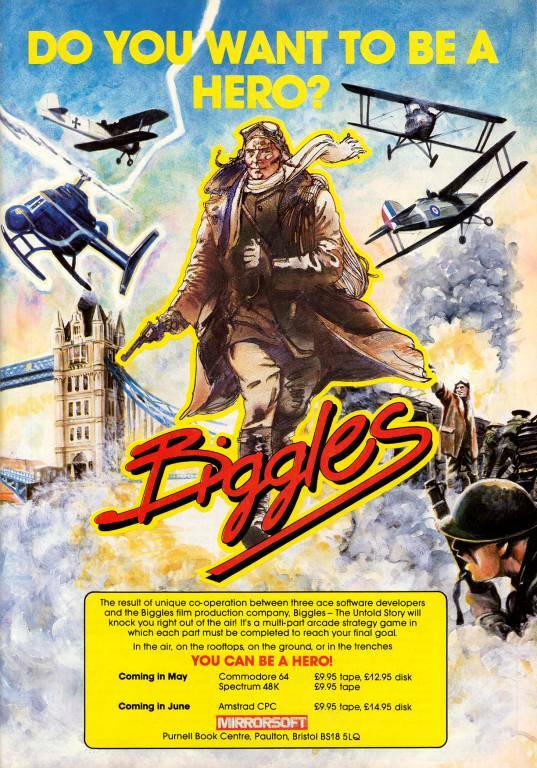 He travels back to warn Biggles – and so the adventure begins. There are two parts to this game, the second part requiring a password. The first part is split into three mini-games. In the first one, you pilot your aircraft along a scrolling playfield. The other two are flip-screen affairs involving shooting, long jumps and avoiding guards. 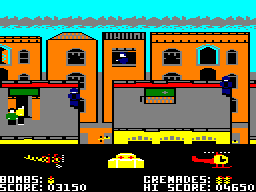 The MODE 0 graphics vary between games, but carry an overall moderate standard. An interesting tune plays upon loading with good in-game effects. Play the hero within a movie as the audience watches! This consists of various stages or movies, such as taking part in a western shoot-'em-up, being trapped in a maze, and the final showdown beat-'em-up, etc. It delivers an odd but appealing challenge where each level is a totally different game style, so it never gets boring and it has that "just one more go" addictiveness. All the graphics are in MODE 0 and vary between games, but overall, they maintain an average standard. Sound-wise, it's imaginative and also includes digitised speech during the game. It's a brave attempt at mixing different games into one box – even if the third 'film' has some dodgy collision detection. Sam Spillade is a private investigator working in 1930s New York – although he isn't particularly clever or successful. At the start of the game, Sam is given two cases to solve, and as Sam, you must travel around New York in your wreck of a car to find clues and follow up any leads. 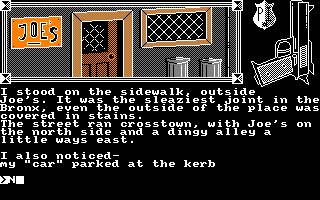 This three-part text adventure was created using The Quill and contains some very well-written text that sets the atmosphere nicely – although there are also some sexual innuendos that I didn't like much. You'll need to read the text carefully, as it reveals clues to where you need to go next. Some locations are also accompanied by pictures. However, there are a few problems with the parser, and the need to be at some locations at particular times in order to solve some puzzles makes this a rather difficult and sometimes frustrating adventure. Barney is a circus performer who needs your help to complete a series of events and please the public. Each level involves circus themes which require skill and timing. There are four levels – tightrope, unicycle, balloons and trampolines. Each has its own charm and hazards – some have more of the latter than others. The graphics are average and collision detection is tight. A pleasant tune plays and old-fashioned sound effects reign supreme. It's a blatant clone of the arcade game Circus Charlie, and done via a Commodore 64 conversion. 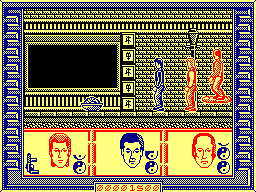 Based on the fairly low-key film of the same name, this is a strange and unexciting little game where the aim is to walk through China's streets, sewers and temples, before taking out the mini-bosses (the 'Storms', for those who have seen the film) and finally the end boss, and rescue the kidnapped girl. There are three interchangeable characters – Jack Burton (an American trucker), some kung fu expert, and Egg Shen (a wizard on a floating cloud). Although the game is unbelievably short, it makes up for this in its difficulty – if one of your three characters dies, you can kiss goodbye to finishing the game. This is never more frustrating than in the sewers, where you just cannot avoid the sewer monsters! The graphics are awful, and the characters move like they're made of wood. Not a terrible game, just really boring. Billy is a streetwise suburban guy ("la banlieue" is French for "the suburbs", by the way), and this is a platform game in which Billy has to explore the suburbs, meet other people on the streets, and find the right objects to give to them. The graphics are superb, especially when you consider when this game was released. 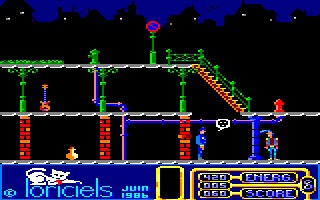 However, it is let down by the controls; getting Billy to jump over gaps is often very frustrating indeed, and you'll often need to position him precisely to climb walls and reach other platforms – and on that point, if you're going to play it, please note that you cannot walk past stairs! Are you a sharp shooter like Billy? 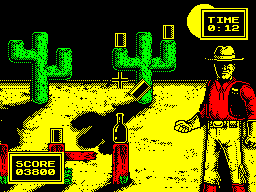 This game has three parts to it – target practice where you shoot tin cans and bottles, an escape from a bank where you shoot all the enemies while avoiding the civilians, and a showdown at high noon which really tests your reflexes; shoot the enemy cowboy within a second or die. Each level consists of these three parts, so they all contain the same thing – not that you'll get past the second level, because the score you have to achieve is unreasonably large. The Spectrum-like graphics don't help either, but I suppose it's OK if you want a quick test of your agility.